–Sports Picture Story 1st Place: Mike Morones/Military Times –The annual Warrior Games features athletes from all four service branches as well as Special Operations Command. The participants’ injuries range from serious illnesses, accidents as well as combat-related mental and physical injuries. Navy’s Red Ramos talks with fellow athletes following the 4×100 relay ended at the 2014 Warrior Games at Garry Berry Stadium in Colorado Springs, Colorado, on Thursday, October 2, 2014. Marine Cpl. Jorge Salazar hands the torch to Navy Sonar Technician Surface 2nd Class Shericka Goza during the opening ceremony for the 2014 Warrior Games at the US Olympic Training Center in Colorado Springs, Colorado, on Sunday, September 28, 2014. Air Force’s Daniel Crane competes against Navy’s Jonathan Adviento in the gold-medal match of the individual recurve archery competition at the 2014 Warrior Games in Colorado Springs, Colorado, on Wednesday, October 1, 2014. Adviento won the gold. The Marine Corps wheelchair basketball team listens to the national anthem before taking on Army in the gold medal match. The Marines defeated Army for the gold medal at the 2014 Warrior Games in Colorado Springs, Colorado, on Friday, October 3, 2014. Marine Corps volleyball coach Brent Petersen gets excited as the Marines close within a point of beating Navy in the first game of Thursday’s gold-medal match. Navy defeated Marine Corps 2-1 to win the gold medal at the 2014 Warrior Games at US Olympic Training Center in Colorado Springs, Colorado, on Thursday, October 2, 2014. Staff Sgt. Jorge Salazar looks to a referee after falling during the Marine Corps-Army wheelchair basketball game at the 2014 Warrior Games on Wednesday, October 1, 2014. Marine Corps beat Army to remain undefeated. Air Force’s Nicholas Dadgostar crosses the finish line in the 100-meter dash open at the 2014 Warrior Games at Garry Berry Stadium in Colorado Springs, Colorado, on Thursday, October 2, 2014. Air Force Tech. Sgt. Lara Ishakawa warms up in the pool before the start of the championship swim events at the 2014 Warrior Games at the US Olympic Training Center in Colorado Springs, Colorado, on Tuesday, September 30, 2014. Army’s Brian Boone warms up before the start of preliminary heats in the swim competition at the 2014 Warrior Games in Colorado Springs, Colorado, on Tuesday, September 30, 2014. Col. Shane Tomko, commander of the Wounded Warrior Regiment, congratulates Adam Vickers, gold medalist in the men’s recumbent cycling race at the 2014 Warrior Games at the US Olympic Training Center in Colorado Springs, Colorado, on Monday, September 29, 2014. Air Force assistant swim coach Cami Stock hugs retired Staff Sgt. Nicholas Dadgostar following a preliminary heat of the 50-meter freestyle swim at the 2014 Warrior Games in Colorado Springs. Dadgostar was injured in a diving accident and only recently returned to the water. The US Air Force Academy Falcons defeat the US Naval Academy Midshipmen 30-21 at the US Air Froce Academy in Colorado Springs, Colorado, on Saturday, October 4, 2014. The halftime program served as the closing ceremony for the Warrior Games. –Sports Picture Story 2nd Place: Rob Ostermaier/Daily Press–From the historic Yorktown Battlefield to the largest naval base in the world, Hampton Roads lives and breathes the military. In addition to producing athletes that go on to compete at Division 1 colleges and universities across the country, Hampton Roads is also home to a large military population. This series of portraits celebrates the best in athletics from a region marked by its military strength. These young athletes, like the men and women who protect our country, represent the best of their field. From Left to Right: Connor Rinoski, Allyson Babinsack, Rachel Brewer, Lia Batchelor, Chantel Ray and Austen Delnicki are photographed on the flight-deck of the carrier of the USS Harry S. Truman. These athletes excelled at their sport earning the title “All-Star”. The USS Truman is the eighth of the Nimitz-class carriers and was commissioned in 1998. The super carrier can accommodate approximately 90 aircraft and the flight deck is 4.5 acres and is capable of launching aircraft from two forward and two waist catapults. Grafton swimmer Jonathan Spires is photographed with an F-15 Eagle on display at Langley Air Force Base. The F-15 is a twin-engine, all-weather tactical fighter that went into service in the 1970’s. Schekel Wallace is the defensive football player of the year from Lafayette High. He is pictured with a RS-1 diesel locomotive. This train engine was used in WWII to move supplies over a railroad that ran from Persia to get supplies behind the lines to the Russians. This mission became especially important in the winter when Russian ports were frozen closed. Chase Pinder of Poquoson High is the baseball player of the year. Pinder is in front of the USS Wisconsin. The Wisconsin first saw action in the Pacific in 1944 and served her final combat mission during Desert Storm. York High’s Connor Rinoski is the golf athlete of the year. Rinoski is teeing off from the deck of the USS Truman using the arresting cable. There are four of the heavy steel cables that snag the tailhook of the aircraft bringing it to a stop on the flight deck. An aircraft coming in to land ideally tries to snag the “3 wire” as it’s referred to. Corey White from Heritage High is the male volleyball palyer of the year. He is pictured with a U.S. Army CH-54 Skycrane helicopter at Ft. Eustis. It is capable of carrying many different types of loads from vehicles to artillery pieces weighing up to 20,000 pounds. Reeves Trott of Lafayette is the male soccer player of the year. Reeves is on the USS Wisconsin underneath the 16 inch guns. The Iowa-class battleship has nine guns that fire explosive rounds some over 2,000 pounds and can accurately engage targets up to 23 miles away. Kelly Esch is the girls volleyball player on the year from Jamestown High. She is pictured with a two and a half ton Army M35 truck also known as the famous “deuce and a half.” This beloved multipurpose vehicle has served in one form or another since WWII to transport supplies and men on the battlefield. Terrence Dingle of Denbigh High is the offensive football player of the year. He is posing on an M60 Patton tank which entered service with the Army in the early 1960’s. The M60 was the main battle tank of the Army until being replaced by the M1 Abrams. These tanks are still in use with militaries in Egypt, Israel and Turkey and were last used in combat my the Marines during Desert Storm. –Sports Picture Story 3rd Place: L. Todd Spencer/The Virginian-Pilot –The 52nd Annual East Coast Surfing Championships, were held this year at the Virginia Beach oceanfront. More than 200 professional surfers competed in the world’s second-oldest continuously-run surfing contest. The 52nd Annual East Coast Surfing Championships, were held this year at the Virginia Beach oceanfront. More than 200 professional surfers competed in the world’s second-oldest continuously-run surfing contest. Holmes Clarke gets covered up on a small beach break during the semifinal of the Grand Master event at the world’s second-oldest continuously-run surfing contest the 52nd Annual Coastal Edge East Coast Surfing Championships . Brogie Panesi gets some air during his Men’s Pro Heat at the 52nd Annual Coastal Edge East Coast Surfing Championships. Michael Dunphy of Virginia Beach, Virginia wins the Vans Pro Final at the 52nd Annual Coastal Edge East Coast Surfing Championships. –Sports Picture Story HM: Jonathon Gruenke/The Daily Press–Wrestlers prepare backstage at Cozzy’s Comedy Club before performing in the Extreme Midget Wrestling Federation. Jacob Brooks, Lil Show, left, waits backstage at Cozzy’s Comedy Club before a wrestling performance Wednesday evening. Wrestlers perform at Cozzy’s Comedy Club Wednesday evening. Wrestlers Jacob Brooks, Lil Show, top, and Chris Blanton, Lil Fabio, perform at Cozzy’s Comedy Club Wednesday evening. Danny Campbell, Lil Nasty Boy, center interacts with the crowd during a wrestling performance at Cozzy’s Comedy Club Wednesday evening. Gotti waits backstage at Cozzy’s Comedy Club before performing in the Extreme Midget Wrestling Federation Wednesday evening. –News Picture Story 1st Place: Griffin Moores/The News-Leader– “Cheer” Waynesboro High School’s Sonny Carey stretches her arms on the ground in preparation for the team’s cheerleading state championship performance in Richmond on Nov. 8, 2014. With emotions running high and the weight of an entire season riding on their shoulders, the annual cheerleading competition brings dozens of teams from around Virginia together to compete for the state championship. Wilson Memorial cheerleading coaches Renae Bailey, left, and Shannon Capriotti, right, celebrate the final moments of their team’s Group 2A cheerleading state championship winning performance in Richmond on Nov. 8, 2014. Wilson Memorial High School cheerleaders hold hands awaiting the results of the Group 2A cheerleading state championship in Richmond on Nov. 8, 2014. Wilson Memorial High School cheerleaders perform during the Group 2A cheerleading state championship in Richmond on Nov. 8, 2014. Wilson Memorial High School’s Savannah Hull, center, talks with teammates before their Group 2A cheerleading state championship performance in Richmond on Nov. 8, 2014. Robert E. Lee High School’s Michelle Spencer walks off the competition mat with her face in her hands after falling during the school’s final performance in the Group 2A cheerleading state championship in Richmond on Nov. 8, 2014. Waynesboro High School cheerleaders warm up before the start of their Group 3A cheerleading state championship performance in Richmond on Nov. 8, 2014. Wilson Memorial High School cheerleaders walk together to the warm up area before their Group 2A cheerleading state championship performance in Richmond on Nov. 8, 2014. Robert E. Lee High School’s Gabby Sansom, who tore her ACL and meniscus in a previous competition, is comforted by her teammates before they started their state finals routine without her in Richmond on Nov. 8, 2014. Wilson Memorial High School cheerleading coach Renae Bailey, left, gives one of her athletes, Rachel VanFossen, a kiss on the cheek before their performance in the Group 2A cheerleading championship in Richmond on Nov. 8, 2014. Robert E. Lee High School cheerleaders run out to the competition mat to start their Group 2A cheerleading state championship performance in Richmond on Nov. 8, 2014. Kelsey Sims, right, a senior on Wilson Memorial High School’s cheerleading team, embraces her classmate Taylor Bailey moments after completing their Group 2A state championship winning performance in Richmond on Nov. 8, 2014. “It’s the best and worst feeling I’ve ever felt in my life,” said Sims, describing the final performance as perfect but bittersweet as it is her last with the team. –News Picture Story 2nd Place: Jonathon Gruneke/Daily Press–Monsur Dawodu, left, stares off into the distance as Jide Oshin, right, hands back the mugshot of Rashad D’Antrell Ashlock, a 20-year-old who has been arrested and charged in connection with the death of Jide’s father, Isaac Oshin, owner of Majik City Gentlemen’s Club and Sports Bar. Dozens of people gathered outside the club Friday evening for a vigil to remember Isaac Oshin. Oshin was shot to death Wednesday evening inside the club at 5825 Jefferson Ave.
Jide Oshin begins to cry while remembering his father, Isaac Oshin, owner of Majik City Gentlemen’s Club and Sports Bar, inside the club before the start of Friday’s vigil. Dozens of people gathered outside the club Friday evening for a vigil to remember Isaac Oshin who was shot to death Wednesday evening inside the club at 5825 Jefferson Ave.
Friends and family listen during a vigil for Isaac Oshin outside Majik City Gentlemen’s Club and Sports Bar Friday evening. Dozens of people gathered outside the club to remember Isaac Oshin who was shot to death inside the club at 5825 Jefferson Avenue Wednesday evening. Former employees, friends and family hold candles and balloons during a vigil for Isaac Oshin outside Majik City Gentlemen’s Club and Sports Bar Friday evening. Dozens of people gathered outside the club to remember Isaac Oshin who was shot to death inside the club at 5825 Jefferson Avenue Wednesday evening. Friends and family lights candles during a vigil for Isaac Oshin outside Majik City Gentlemen’s Club and Sports Bar Friday evening. Dozens of people gathered outside the club to remember Isaac Oshin who was shot to death inside the club at 5825 Jefferson Avenue Wednesday evening. Rita Thornton begins to cry during a vigil for Isaac Oshin outside Majik City Gentlemen’s Club and Sports Bar Friday evening. Dozens of people gathered outside the club to remember Isaac Oshin who was shot to death inside the club at 5825 Jefferson Avenue Wednesday evening. Terry Riddick walks past a sign during Friday evening’s vigil for Isaac Oshin outside Majik City Gentlemen’s Club and Sports Bar Friday evening. Dozens of people gathered outside the club to remember Isaac Oshin who was shot to death inside the club at 5825 Jefferson Avenue Wednesday evening. –News Picture Story 3rd Place: Jonathon Gruneke/Daily Press–Guests find their seats prior to the christening of the submarine John Warner SSN 785 Saturday evening at Newport News Shipbuilding. Navy crew of the submarine John Warner SSN 785 stand before the start of the christening Saturday evening at Newport News Shipbuilding. Adelynne MacKenzie, 2, plugs her ears as the U.S. Fllet Forces Band plays prior to the christening of the submarine John Warner SSN 785 Saturday evening at Newport News Shipbuilding. Navy personnel and guests tour around the submarine John Warner SSN 785 before the christening Saturday evening at Newport News Shipbuilding. Jeanne Warner christens the submarine John Warner SSN 785 Saturday evening at Newport News Shipbuilding. Jeanne Warner, John Warner and Commander Dan Caldwell acknowledge the crowd after fireworks and christening the submarine John Warner SSN 785 Saturday evening at Newport News Shipbuilding. Navy crew of the submarine John Warner SSN 785 watch as fireworks and a light show fills the sky after christening the submarine John Warner SSN 785 Saturday evening at Newport News Shipbuilding. –Feature Picture Story 1st Place: Jay Westcott/Freelance–“The Rebel Troubadour”: For the past year I’ve been documenting musician Phillip Roebuck. He performs as a one-man band. Roebuck was in an alternative rock band in the Õ90s with his cousin Shea Roebuck. The two put out an album on their own in the mid-’90s, but those efforts failed to get traction. In 2000, Roebuck started experimenting in the New York subways with a banjo in his hands and a drum rig on his back, which consists of a bass drum, a tambourine and levers to operate both with straps that go down to his feet. These days, Roebuck, 43, is back in his home town of Norfolk, Va. ,still making music and still trying to make it. His wife, Phoenix, works as his manager and merchandiser. On stage, he is a rollicking storm of punk rock, folk, rock, blues and bluegrass. But his unique style of performing can be its own kind of trap. I want to make it as a songwriter, says Roebuck, not as a one-man band. The current approach to performing developed out of necessity for me but that’s not what he wants to be known for. In that way, his vision has stayed the same: It’s all about the songs. HAMPTON, VA – APRIL 17: Phillip Roebuck performs to a packed house at The Taphouse on Thursday, April 17, 2014 in Hampton, Va.
HAMPTON, VA – APRIL 17: Phillip Roebuck takes a drag off of his vaporizer while back stage at The Taphouse on Thursday, April 17, 2014 in Hampton, Va.
HAMPTON, VA – NOVEMBER 8: Straps attached to his boots activate the drum rig on his back while Phillip Roebuck performs at The American Theater on Saturday, Nov. 8, 2014 in Portsmouth, Va.
VIRGINIA BEACH, VA – FEB 15: Dada Gauche, left, accompanies Phillip Roebuck on stage during his album release party at The Jewish Mother on Saturday, Feb. 15, 2014 in Virginia Beach, Va.
CHARLOTTESVILLE, VA – MARCH 23: Phillip Roebuck drinks his master cleanse solution while driving to a concert venue on Sunday, March 23, 2014 in Charlottesville, Va. Roebuck is performing at a benefit concert in the evening. CHARLOTTESVILLE, VA – MARCH 23: Phillip Roebuck performs at a benefit concert at the Paramount Theater on Sunday, March 23, 2014 in Charlottesville, Va. Poorly promoted, the benefit concert attendees were mostly the musicians that were asked to perform. CHARLOTTESVILLE, VA – MARCH 23: Phillip Roebuck, left, is comforted by his Phoenix after performing at a benefit concert at the Paramount Theater on Sunday, March 23, 2014 in Charlottesville, Va. Something Roebuck ate didn’t agree with him and made him sick. LANCASTER, PA – OCTOBER 3: Back in their hotel room, Phillip Roebuck, left, checks his email on his smartphone while his wife Phoenix Roebuck, right, enjoys a microwaved burrito from a gas station after a performance at The Chameleon Club in the early hours of Friday, Oct. 3, 2014 in Lancaster, Penn. Roebuck opened up for The Devil Makes Three for two nights on their tour. VIRGINIA BEACH, VA – OCTOBER 4: Phillip Roebuck works on a song in his studio on Saturday, Oct. 4, 2014 in Virginia Beach, Va.
CHESAPEAKE, VA – NOVEMBER 20: Phillip Roebuck unloads his gear “backstage” before a performance at The Riff House on Thursday, Nov. 20, 2014 in Chesapeake, Va. The venue is known for having hard rock and heavy metal acts, but is hosting an “Americana Night” this evening. The backstage area is nothing more than a curtain separating a spot for musicians to set their gear down. CHESAPEAKE, VA – NOVEMBER 20: Spit flies as Phillip Roebuck belts out a song at The Riff House on Thursday, Nov. 20, 2014 in Chesapeake, Va. The venue is known for having hard rock and heavy metal acts, but is hosting an “Americana Night” this evening. CHARLOTTESVILLE, VA – OCTOBER 3: Phillip Roebuck waves goodbye to the crowd after performing at The Jefferson Theater on Friday, October 3, 2014 in Charlottesville, Va. Roebuck opened up for The Devil Makes Three for two nights on their tour. Terry Hall, 31, cosplays as Kiriya. Hall said he chose his character because Kiriya is his “favorite online character. –Feature Picture Story 3rd Place: Griffin Moores/The News-Leader–Matthew Mitchell sits for a picture in his room wearing his prosthetic arm. Although the arm is intended to aid in completing everyday tasks his mom Lori Mitchell describes it more as a hinderance for the 11-year-old. While Matthew was developing in the womb, a thin strand of tissue wrapped so tightly around his arm that the limb failed to fully form, a condition called amniotic band syndrome that may contribute to two percent of all miscarriages. Since he was a baby, he has had to find ways to adapt to life with only a left hand. That has done little to hold him back. Matthew stretches his “narm,” a nickname he created as a mix between “nub” and “arm,” while making holiday treats alongside his cousin Tori Critzer. Matthew plays video games while hanging out with his cousin. Watching the screen it is hard to tell which of the players was using only one hand. Matthew struggles through a round of pushups during gym class at Wilson Elementary School. Hunter Ingersoll, Matthew’s P.E. teacher, says he admires the 10-year-old’s spirit and unwillingness to use his disability as an out for difficult activities. “IÕve never seen the kid when he wasnÕt smiling and it really made me feel good for him to come in and try whatever we were doing,” Ingersoll said. Looking for his Elf on the Shelf, Matthew walks through his family’s living room at their home in Fishersville. Matthew says the Pledge of Allegiance before homeroom class at Wilson Elementary School. One of his dream’s is joining the military to drive trucks, fly jets or work with computers. Matthew wrestles with his cousin Patrick Henderson on a chilly afternoon in Waynesboro. Matthew ties his shoes while getting ready for school. Figuring out how to knot his laces with one hand wasn’t easy, but as his 4th grade teacher Martina Carroll explains, his “let me keep going” attitude carried him through. Matthew dribbles a basketball during gym class at Wilson Elementary School. Although there have been moments of anxiety for Matthew concerning how he’s being perceived by classmates, “They treat me like IÕm one of them,” he said. Matthew hugs his mom Lori Mitchell as she gets ready to leave for work early in the morning. One of the first things Lori will tell you about her son is that “can’t” is a word he’s not allowed to use. Matthew Mitchell cracks an egg while cooking breakfast early in the morning before heading to school. Matthew Mitchell laughs as he’s sprayed with a hose before diving down a slip and slide at a Staunton Braves and Waynesboro Generals baseball game during the summer. –Feature Picture Story HM: Autumn Parry/The News& Advance–Promise Guy, 13, is encouraged by her host mother Barbara Austin to touch moss on a tree, while on a scavenger hunt in the woods at Claytor Natures Study Center in Bedford, Va. “I’m not built for this,” said Promise as she ventured on the nature walk with her host family. This is Promise’s fourth year participating in The Fresh Air Fund of New York City, which sends thousands of children to rural homes every year so they can experience life outside the city. Sahara McKnight, 12, holds onto Promise Guy, 13, as they rise from underwater while swimming in the pool at the Presbyterian Home in Lynchburg, Va. Swimming was one of Sahara’s favorite activities during her stay with the Austin family. Promise Guy, 13, and Sahara McKnight, 12, run up the hill, screaming, as they try to escape the rain, which brought an end to their evening fishing trip at a pond in Bedford, Va. The girls are part of The Fresh Air Fund of New York City, which sends thousands of children every year to rural homes so they can experience life outside the city. Promise and Sahara share a laugh while preparing blackberry cobbler with fresh berries they picked earlier that morning at Morris Orchard in Monroe, Va.
Sahara (left) and Promise (right) cuddle together on the recliner as they watch TV on a slow day at their host family’s home in Madison Heights, Va.
Barbara Austin comforts Sahara as she wipes away tears after frustrations from making rubber band jewelry led her to take a break from the class at Michaels in Lynchburg, Va. Promise looks out the window at Sahara playing outdoors while at her host family’s home in Madison, Heights, Va. The girls are part of The Fresh Air Fund of New York City, which sends thousands of children every year to rural homes so they can experience life outside the city. Promise slowly reels in her line as she waits for fish to bite during a fishing trip at a small pond in Bedford, Va. Promise began to express her frustrations after hours of fishing without any luck. Promise reads recipe instructions as she helps her host mother Barbara Austin make blackberry cobbler from the berries they picked earlier in the morning at Morris Orchard in Monroe, Va.
Sahara and Sapalo Puta wait for the bus to arrive to take them back to New York City at Northminister Presbyterian Church in Madison Heights, Va. on the last day of their visit in Virginia. Promise sits in the car as she refuses to get on the bus heading back to New York City at the end of her ten day stay in Virginia with Barbara Austin. –Feature Picture Story HM: Mike Morones/Navy Times—The plebes of the class of 2018 arrive for Induction Day, or I-Day, at the US Naval Academy in Annapolis, Md., on —-Tuesday, July 1, 2014. I-day marks the beginning of their transformation from civilian to future naval officer, starting with a haircut, memorizing the rules, Navy traditions and facts in Reef Points and the appropriate military responses to commands. Sharon and Roy Ledesma say goodbye to their son Sam as he and his fellow plebes of the class of 2018 arrive for Induction Day at the US Naval Academy in Annapolis, Md., on Tuesday, July 1, 2014. Ensign Ryder Ashcraft distributes copies of Reef Points to incoming plebes at the US Naval Academy in Annapolis, Md., on Tuesday, July 1, 2014. Zachary Wesemsnn, left, and Mitchell Perry get their hair cut as plebes of the class of 2018 arrive for Induction Day at the US Naval Academy in Annapolis, Md., on Tuesday, July 1, 2014. Plebes listen to instructions during Induction Day at the US Naval Academy in Annapolis, Md., on Tuesday, July 1, 2014. Incoming plebes get measured for uniforms during Induction Day at the US Naval Academy in Annapolis, Md., on Tuesday, July 1, 2014. Midshipmen 1st Class Eric Viscardi, left, Charles Parker Jordan, working as detailers on Induction Day, inspect plebes at the US Naval Academy in Annapolis, Md., on Tuesday, July 1, 2014. Marine second lieutenants correct plebes as they learn to salute properly on Induction Day at the US Naval Academy in Annapolis, Md., on Tuesday, July 1, 2014. A plebe studies his copy of Reef Points on Induction Day at the US Naval Academy in Annapolis, Md., on Tuesday, July 1, 2014. Despite a push to move away from technology while on the road my daughter, Opal Facun, 3, watches a movie and reacts when she spots dairy cows dotting the landscape while heading west on US 64 in Virginia. The morning after completing the first leg of the trip my wife Jasmine Facun, our daughter Opal and Levi-Joseph, 9, wait to be seated at a cafe in Athens, Ohio. We stopped in Athens to give my son a tour of Ohio University where I attended school. Open spaces and radical changes in the landscape serve as a crash course in US geography. Just off of US 76 in Northeastern Colorado, a handmade sign at a gas station, unintentionally serves as a definitive icon of the Americana road trip. From the terrace of Lookout Studio, my wife Jasmine and our son Levi-Joseph, 9, visit the South Rim of the Grand Canyon National Park in Arizona. Providing our children the opportunity to visit one of our nation’s National Parks was one of many goals we set prior to the road trip. Road trips don’t always go as planned. While en route to a relatives ranch in Colorado we discovered that due to a miscommunication we weren’t going to be able to stay at their home. We made a quick adjustment and ended up visiting a friend in Denver, CO where our daughter Opal, 3, curled up in the warmth of the morning sun. Levi-Joseph, my wife Jasmine and Opal, 3, feel at home in Sedona, AZ. The kids fell in love with Northern Arizona and kept asking if we could move to Flagstaff where Jasmine’s father and stepmother reside. Road trips often lead us to loved ones who live across multiple state lines. In Palos Verdes, California the family catches up with cousins and other relatives for a birthday party. Levi-Joseph and Jasmine search for sea life in the tide pools at Cabrillo Beach in San Pedro, California. Jasmine’s father used to take her to the same shoreline to search for marine life when she was a young girl. Jasmine wanted our son to share in those memories and to make some of his own. Opal plays at her grandparents’ house in Mission Viejo, California. A few days later we would begin the 2,700 mile drive back east to Virginia. Congrats to all the winners in this years competition! 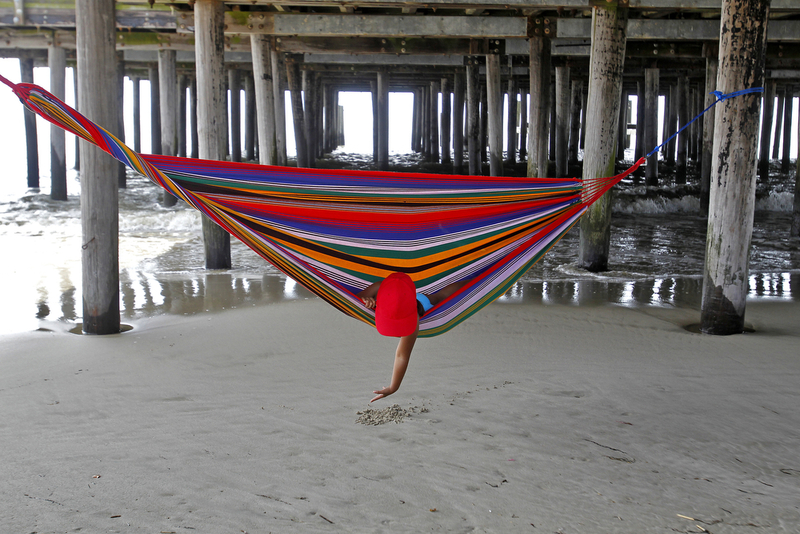 –Feature 1st Place: Jonathon Gruenke/Daily Press– Erica Carcamo, 4, plays in the sand while laying in a hammock as waves wash ashore underneath the pier of Buckroe Beach Friday morning. –Feature 2nd Place: Jay Westcott/Freelance–Doug Church, of Mishawaka, Indiana, performs during finals of the 2014 Ocean City ElvisFest on Sunday, Oct. 26, 2014 in Ocean City, Md. Church went on to win the 2014 Ocean City ElvisFest. –Feature HM: Kevin Morley/Richmond Times-Dispatch–A dog waits for its human during the Fido Fest canine event on Brown’s Island, Sept. 21, 2014. –General News 1st Place: Rob Ostermaier/Daily Press–Former Virginia governor Bob McDonnell is swarmed by local and national media after leaving the federal courthouse in Richmond. The jury in his corruption case did not reach a verdict after the second day of deliberations. –General News 2nd Place: Mike Morones/Military Times–Steven R. Woods becomes emotional after receiving the flag for his father Army Staff Sgt. Lawrence Woods during a burial service on Friday, March 21, for seven service members who died on Oct. 24, 1964 near Bu Prang, Vietnam. The remains of Staff Sgt. Woods were recently identified though partial remains of six service members and the complete remains of an eighth crew member were recovered in 1964. –General News 3rd Place: Scott Elmquist/Style Weekly–During a vigil, Keyari Edwards, 7, holds a photograph of her father Kiarri “Kee Kee” Edwards, who was murdered in a shooting on Dinwiddie Avenue. –General News HM: Rob Ostermaier/Daily Press–Khori Allende-El of the Moorish Science Temple of America marches with about forty peaceful protestors up Jefferson Ave. to the Newport News Police headquarters. The march was held to draw attention to the situation in Ferguson, Missouri and to gun violence in general. Gina Junkermann places running shoes with the message of “MEG STRONG WE LOVE YOU!” at the corner of Hickory Hill Road and East Patrick Henry Road in honor of Meg Menzies, who died a day before after being struck by a car driven by a drunken driver. –Illustration 1st Place: Alexa Welch Edlund/Richmond TImes-Dispatch–A good credit score using FICO numbers. –Illustration 2nd Place: Stephanie Klein Davis/Roanoke Times–Table 50’s mixed fruit moonshine cocktail made with Virginia Lightning and local fruit from Tim Belcher at Rolling Meadows Farms in Snow Creek (Franklin County), is mixed and served in a mason jar. –Illustration 3rd Place: Nikki Fox/Daily News-Record–Don and Lindsay Denny act out part of the Christmas Story. The couple’s “retro house,” is one of the stops on the Downtown Holiday Tour in Harrisonburg this year. –Lifestyle 1st Place: L. Todd Spencer/The VIrginian-Pilot–Three year old Layla Sawicki inside her home in Virginia Beach, Virginia, along with Nasyah her service dog who is trained to spot seizures in Layla. –Lifestyle 2nd Place: Joe Fudge/Daily Press–The city is making the this family get rid of their backyard chickens they have had since the end of the summer. Lauren Rash 3 picks up her chicken that she loves. –Lifestyle 3rd Place: Daniel Min/Richmond Times-Dispatch –Rebecca Harris, foreground, and other Richmond Community High School 9th graders react to cold wave as they visit beach after the long day of their daily activities in Chincoteague. For some of them, this is their first time camping trip and being away from their parents as they grew up in urban setting and with single parents. “It’s a classroom that using a whole world as part of the learning tools. Bonding, share jokes they have, experience of being able to take care of themselves and their friends are really the other half of this trip,” teacher Summer Schultz said. –Lifestyle HM: Alexandra Welch Edlund/Richmond Times-Dispatch–James Howard helps slow down Vance Sutphin’s wheelchair as Anthony Pendergrast guides it as they descend to the fishing dock during a retreat at Howard’s home for veterans from McGuire VA Hospital’s Spinal Chord Injury Unit Thursday, June 5, 2014. Nancy Wellons, James’ mother, carries the fishing pole. Pendergrast is a bus drive at the hospital. –Lifestyle HM: Rob Ostermaier/Daily Press–A group of about forty members of the community pray before a short protest march up Jefferson Ave. to Newport News police headquarters Wednesday as they try to draw attention to the situation in Ferguson, Missouri and the shooting of Michael Brown. –Pictorial 1st Place: Rich-Joseph Facun/The Virginian-Pilot –Aida Rodriguez plays a game of dominoes at her home in Mission Viejo, California. Aida, a Cuban immigrant. –Pictorial 2nd Place: Jonathon Gruenke/Daily Press–Patrik and Camilla Lasson walk their dog Roxy as snow piles melt while the sun sets Friday evening near Lions Bridge. –Pictorial 3rd Place: Rob Ostermaier/Daily Press–Spring pollen washed away by heavy rain flows into Lake Maury near the Mariners Museum. Every spring the vehicles, houses and streets are covered with the fine yellow powder. –Pictorial HM: Nikki Fox/Daily News-Record–A flock of Canadian geese settle down for the evening north of a Harrisonburg, Va., cornfield as Massanutten Mountain looms in the background on Feb. 11, 2014. –Portrait 1st Place: Rob Ostermaier/Daily Press–Maurice Smith was the radio operator on a C-47 that flew through a wall of flack on D-Day to drop Airborne troopers behind the German defenders. Mr. Smith passed away two weeks after this photo was taken. –Portrait 2nd Place: Jay Westcott/Freelance–Warren Taylor, a member of the Pamunkey Indian tribe, is dressed and painted for a ceremony commemorating the 400th anniversary of Pocahontas’ wedding to John Rolfe, on Saturday, April 5, 2014 in Jamestown, Va.
–Portrait 3rd Place: Griffin Moores/News-Leader–Kavon Robertson, who at 14-years-old has won six boxing championship belts, rests for a moment after a bout of hitting the punching bag at the Staunton Boxing Club on Wednesday, Sept. 10, 2014. Robertson is training for the chance to fight with the the U.S. Junior Olympic team in January. –Portrait HM: Rich-Joseph Facun/The Virginian-Pilot–Hennglise Dorival, 15, who is from Haiti, at her host family’s home, Friday, April 25, 2014 in Virginia Beach, VA. Dorival suffers from a massive facial deformity caused by a tumor that began growing four years ago in one of the sinuses of her nose. This coming Monday, staff from Operation Smile will remove the tumor at CHKD through the World Care program. –Sports Action 1st Place: Peter Casey/Freelance–Virginia Beach, VA, USA; Competitors dive at the finish of the second round of the beach flag race finals during the 2014 USLA National Lifeguard National Championships. –Sports Action 2nd Place: Peter Casey/Freelance–Russell Henley chips up to the 1st green during the second round of The Players Championship at TPC Sawgrass – Stadium Course. –Sports Action 3rd Place: Rob Ostermaier/Daily Press–Brandon Britt of William & Mary gets a hand across the face from Rodney Williams of Drexel as he drives to the basket during the first half at W&M. –Sports Action HM: Alexandra Welch Edlund/Richmond Times-Dispatch–Louisville’s Eli Rogers loses control of the ball against UVA’s Anthony Harris in the first half. Lynchburg Hillcats catcher Joe Odom makes an out early in a game between the Hillcats and the Winston-Salem Dash Friday night August 8, 2014 at City Stadium in Lynchburg. –Sports Feature 2nd Place: Alexandra Welch-Edlund/Richmond Times-Dispatch–Maryland’s Tayler Stiles puts another cap on Andrew Amaro’s head as Ben Brewster watches during their NCAA game against UVA in Charlottesville Sunday, June 8, 2014. –Sports Feature 3rd Place: Jason Hirschfeld/Associated Press–The Savannah State women’s basketball team celebrates their 65-47 NCAA college basketball game win over Maryland Eastern Shore in the Mid-Eastern Athletic Conference tournament championship, Saturday, March 14, 2015 in Norfolk, Va.
–Sports Feature HM: Max Oden/The News & Advance–Joshua Fowler, of the Liberty University S.O.A.R. Dunk Team, loses the ball between his feet as he flies through the air on a dunk attempt during halftime of a Liberty University women’s basketball game against VCU at the Vines Center. The team uses small trampolines to achieve their acrobatic dunks. –Sports Feature HM: Kevin Morley/Richmond Times-Dispatch–UVA Cavaliers celebrate after defeating the Maryland Terrapins in the NCAA Super Regional at UVA, 11-2, June 9, 2014. –Sports Feature HM: Stephanie Klein-Davis/Roanoke Times–Radford High School fans supported their team on Saturday in the VHSL Group 1A West Championship against Altavista High School. Sharon Jones, mother of player, Nate Jones had the poster heads printed of the team. (30)Altavista won 49-44. Photo taken March 15, 2014. –Sports Feature HM: Bill Tiernan/The Virginian-Pilot–Cullen Kirk,9, of Virginia Beach( green sleeves) rests over the wall along third base during a break in light rain showers as he waits for Orioles players to sign autographs at Harbor Park Saturday afternoon, March 29, 2014 before the Orioles exhibition game with the Norfolk Tides. Cullen is a Red Sox fan according to his dad. –Spot News 1st Place: Hyunsoo Leo Kim/The Virginian-Pilot–A Norfolk police pauses next to police vehicle as he investigates the scene of shooting where Norfolk Police Officer Brian Jones was killed in the line of duty late Friday, at the 7400 block of Wellington Road in Norfolk, Va. 2014. –Spot News 2nd Place: Jonathon Gruenke/Daily Press–A Newport News police officer assists a resident away from an apartment building in the 700 block of Waterfront Circle as Newport News firefighters respond to a fire Friday afternoon. –Spot News 3rd Place: Rob Ostermaier/Daily Press–Friends and family of stabbing victim Taiwo Douglas-Wells react to the news that he had died from his wounds sustained in an attack behind Newsome Park Elementary School. –Spot News HM: Griffin Moores/The News & Advance–An injured driver who crashed his drilling rig through a guard rail along I-64 screams as rescue workers attempt to remove him from an embankment in Waynesboro on Sept. 24, 2014. Jonathon Gruenke, a staff photographer at the Daily Press in Newport News, is the 2014 Virginia Photographer of the Year, winning with 25 points spread among seven awards. Gruenke, who shared the 2014 Clip Photographer of the Year title with Roanoke’s Erica Yoon, edged out fellow Daily Press staffer and acting VNPA president Rob Ostermaier, who earned 21 points with nine awards. Finishing in third place was Mike Morones of the Military Times newspapers in Springfield with 16 points with 4 awards including top portfolio. In all, 21 photographers from across the state placed in the 2014 contest. The contest was judged at the offices of Gannett Government Media in Springfield, VA by Preston Keres, Molly Riley and Dan Gross.